Tag line: "Packed with Technicolor Thrills!" Trivia: When this film was released in Spain, its title was changed to "Colorado Jim"
James Stewart worked with director Anthony Mann on five westerns, starting with Winchester 73 in 1950 and continuing straight through to 1955’s The Man from Laramie. Aside from turning out five excellent films, this pairing also marked a change of pace in Stewart's career. Gone was the disillusioned do-gooder of Mr. Smith Goes to Washington, the loveable underdog of It’s a Wonderful Life and the eternal optimist of Harvey. Under Mann’s skillful direction, Stewart began exploring much darker characters, men hardened by life who were always looking for a way to come out on top, whatever the cost. It was a time that afforded James Stewart his opportunity to walk on the dark side, and by all appearances, the actor was just as comfortable in the shade as he was in the light. Howard Kemp (James Stewart), a bounty hunter from Kansas, has been tracking wanted murderer Ben Vandergroat (Robert Ryan) for hundreds of miles. With the help of two partners he picked up along the way; unlucky prospector Jesse Tate (Millard Mitchell) and dishonorably discharged Union soldier Roy Anderson (Ralph Meeker), Kemp does finally capture both Vandergroat and his companion, Lina Patch (Janet Leigh), a young girl the fugitive's been looking after for some time. Unfortunately for Kemp and his partners, the journey back to Kansas to collect their reward is fraught with dangers on all sides, not the least of which is the one they pose to each other when greed rears its ugly head. Before long, each man is searching for a way to claim the $5,000 reward on Vandergroat's head for themselves, which may just require them to take extreme measures before they ever reach the Kansas border. As is Anthony Mann’s style, there are no clear-cut heroes in The Naked Spur, nor are there any obvious villains. Stewart’s Kemp is bound and determined to bring a wanted man to justice, but only so he can collect the reward. The fact that Vandergroat may be innocent means nothing to him (“it’s him they’re paying the reward on”, he reasons). Kemp even tries at one point to swindle Roy and Jesse, who helped him capture Vandergroat, out of their share of the reward. On the reverse side of the coin, Vandergroat is wanted for murder, but has also set himself up to be a father figure to Lina, the daughter of his deceased best friend. Vandergrost's gone out of his way to care for the young girl, even if he does use Lina from time to time to stir up tension between Kemp and his ‘partners’. Then there’s Roy, a soldier who was thrown out of the army for taking up with an Indian chief’s daughter (whether or not the chief’s daughter was a willing partner is never fully disclosed). Wonderfully portrayed by Ralph Meeker, Roy has a nasty disposition, and makes unwanted advances towards Lina every chance he gets. 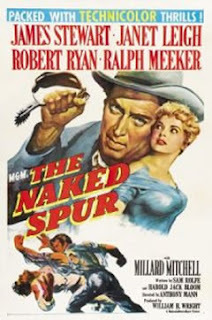 With all the lines between good and evil erased, none of the characters found on either side of The Naked Spur are particularly trustworthy, which brings a level of unpredictability to the film. With each man capable of any action, good or bad, we in the audience have no idea what to expect from scene to scene. And that, my friends, is what makes a movie great. I've always wondered what the alternative was to a naked spur. A spur with its rowel (which is actually the naked part, anyway) points covered with protective plastic tips, in which case the horse remains unmoved by your heel work? And, is this related to the similar situation with chaps? joem18b: You know, you raise an excellent point! I tried searching on Google for some idea of what a "naked spur" might be. Unfortunately, through the 1st 10-15 pages, every result referred back to the movie (which, may, in itself, have given us the answer). But I'll continue searching. If there is, indeed, such a thing as a "naked spur", then there must be a picture floating around out there of a fully dressed one. The westerns that Mann & Stewart did together are among the best films that either made. I love THE NAKED SPUR, which I watched for the first time a few months ago, and WINCHESTER '73 is one of my all-time favorites. @Ian: I agree with you on both counts: the films of Stewart and Mann were truly incredible, and WINCHESTER '73 is my personal favorite as well. I'll be covering that one, and all of the Mann/Stewart westerns, at some point over the course of this "experiment". Thanks for the comment, and have a good one.